Analyst Dave Rosenberg speaks about the sour state of the US housing market in this morning’s appropriately titled “Guinness With Dave” newsletter. As month-over-month slides in housing continue to increase, we are running out of ways to shield ourselves from the cold, hard truth. 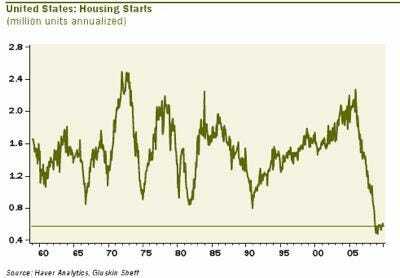 Housing starts are toast, like it not. And you can’t blame the weather for that:Guinness With Dave: The U.S. housing market is definitely weakening. That 5.9% mum slide in housing starts, to 575k at an annual rate in February, was far more than just a weather report because even excluding the Northeast, activity still fell 5.4% on the month. The single-family sector dipped 0.6% mum, to 499k at an annual rate. Single- family starts appear to have bottomed out last spring/summer, but the problem is that there is no follow-through despite all the stimulus — in large part because of the still large overhang of supply. The multi-family sector was the key culprit, falling 30.3% mum in February back down to 76k at an annual rate. Moreover, there is no reason for the weather to have played a role in the fact that building permits were down 1.6% in February — the second decline in the past three months. And, the NAHB index is highly suggestive of further declines in both home sales and housing starts in coming months. Single-family starts and the NAHB are both back down to June-July levels and yet the S&P Homebuilding index is up 40% from that time. That is what you call …. a whole lot of air.